Core Values Topics: Diversity & Inclusion, Problem Solvers, encourage Ambition, Accountable Self Improvement, Pursue of Excellence, Empathy, stay Focused, Adaptable, Planet Caring, Transparency, Family. 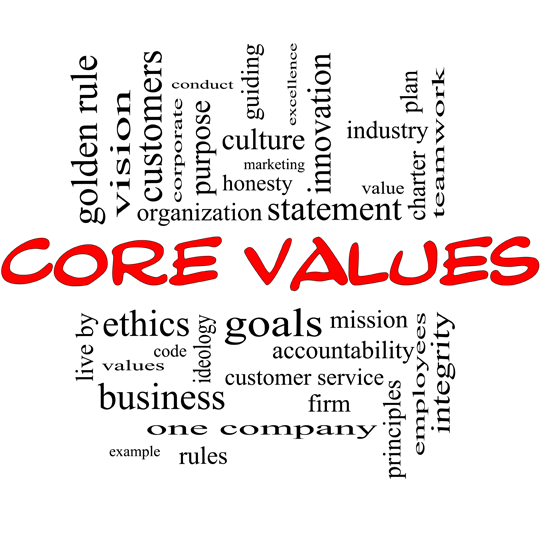 Core Values are the Heart & Soul of your Business !!! Core Values support the Mission Statement, short-term Goals & long-term Vision of your Business. They provide guidance on how to conduct yourself in most situations – to meet the above objectives. They are your company’s principles, beliefs, or philosophy of how to usually act in these situations. At the heart of every good company are the Core Values that drive day-to-day activities. The Core Values of a company aim to guide the actions and behaviors of employees & management alike. Core Values are more than just words on a wall. They’re the backbone of a company, the common thread that holds everyone together, uniting them with shared expectations. Source: The companies on Fortune’s “100 Best Companies to Work For” list have mastered living, breathing, and embodying their Core Values on a daily basis. Here’s a look at 10 of the best Core Values for companies from the 2018 Fortune Best Companies to Work for winners. #1. Diversity & Inclusion . . .
are two of the most important Core Values a businesses can have. Diversity allows the flow of “diverse” ideas – that often are quite significant. Inclusion: startups & small businesses alike must make sure all employees feel respected, valued, & welcome. Companies that prioritize inclusion & respect diversity offer equal opportunities to all to contribute and create a positive work environment for their diverse workforce. There are three types of people: 1) people who “want” things to happen, 2) people who “watch” things happen & 3) people who “make” things happen. Ambition can be a really powerful value if it leads to improvement of your product or services or the management of your company. The obligation of an individual to account for their activities, accept responsibility for them, give it their best efforts, then disclose the results in a transparent manner – is of utmost importance to an organization. Own up to what is not performing well, so we can do what we need – to improve. If you have people who are not accountable, they may begin to sweep things under the rug or worse, begin to point fingers or pass blame around. Companies that value self-improvement see greater employee engagement & low turnover rates. A good career should provide free or low-cost training & education toward advancement opportunities, personality growth, & motivation. Any company that does not value the Pursuit of Excellence is setting itself up for failure. Companies that value excellence are driven & excited by their employees efforts. This passion is reflected in the attitudes & success of employees. #7. Empathy . . .
is not easy to come by. It has to be a natural characteristic of caring for others – sometimes putting their needs ahead of yours – if the situation merits it. The ability to understand the challenges that others deal with, what they care about & how you can help them meet their goals + maximize their potential, is a character trait to look for in every person you hire. #9. Adaptable . . .
means one thing: How well does a person handle ambiguity & competing demands? How well we adapt to change, will determine how durable our success will be. In a world of ambiguity, those who can rapidly respond to change, adapt & turn in a good performance are outstanding players – that you want on the team. Show your appreciation. Within the past decade, the desire for enviro-friendly practices & procedures has grown exponentially. Whether this is through direct efforts or philanthropic pursuits, companies have taken steps to address this need. This Core Value is important for companies that are dedicated to establishing trust & credibility. Working for a company that values honesty means that you can trust that the work you are doing is founded on integrity. The importance of a trusting relationship between the company and customers cannot be understated. Pick those who consistently practice good moral & ethical standards. A business should have a team of people who care deeply about integrity. When this happens everyone benefits — partners, customers & most importantly – all your employees. Comments: Do you know of any other Core Values that should be included? For more Info, click on Core Values.